US presidential candidate Donald Trump was fairly subdued during last night’s (Oct. 19) US presidential debate—his tone was restrained and he didn’t interrupt opponent Hillary Clinton or the moderator Chris Wallace, even when things got heated. He slipped up at moments, sure, like when he refused to say whether he would accept the results of the election, and accused the “dishonest media” of poisoning voters minds against him. But overall, we saw a very different Trump last night—dare we say, a more presidential Trump—than we did in the first two debates. The effort suggests a broader shift from the Trump campaign to position the candidate not as the lesser of two evils, but as the best man to fill the role of US commander in chief. Indeed, new research from the Wesleyan Media Project at Wesleyan University shows that Trump’s advertising has been more positive than negative over the past month, whereas in the past it primarily contrasted the two major party nominees. With this shift, the Trump campaign might be trying to supplement Trump’s sometimes aggressive behavior on the campaign trail with more positive messaging that’s focused on the candidate. To reach its findings, the Wesleyan Media Project analyzed the 117,000 presidential ads that aired on broadcast TV from Sept. 16 to Oct. 13, including more than 15,000 ads from the Trump campaign. It found that half of those Trump ads were positive, meaning that they focused solely on the opponent the campaign favors: Trump. 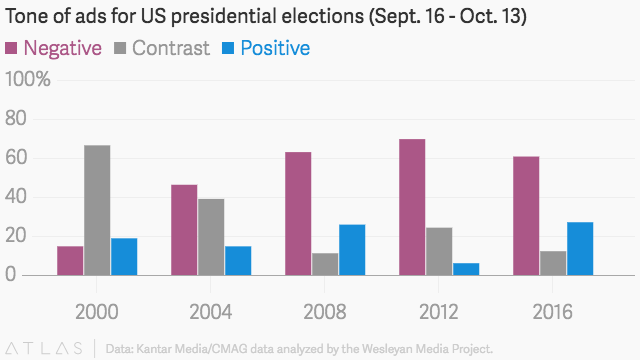 About one-third were negative ads, which focused on Clinton, and the remainder contrasted the two candidates. The Clinton campaign, it must be noted, has aired far more ads than the Trump campaign. Clinton ran more than 62,400 ads during the mid-September to mid-October period compared to Trump campaign’s 15,400. The remaining 39,000 or so ads that aired were from third parties, such as super PACs, the National Rifle Association, and AARP. During the previous month-long period studied by Wesleyan, which contained the first Trump campaign TV ad buy, the campaign aired no positive ads. The vast majority of the ads during that period pitted Trump against Clinton. The overall tone of US presidential ads in this election, including those from groups supporting the candidates, has gotten more positive in the home stretch of the general election, even more so than in elections past, the research found. That could help the candidates get through to more undecided US voters who are still weighing their votes for either Clinton or Trump. This subgroup of undecided voters have responded best to positive ads with uplifting messages during the general election, September research by ad-tracking firm Ace Metrix showed. A little over 30% of ads from the Clinton campaign that aired from mid-September to mid-October were also positive, the Wesleyan research showed. That was consistent with the prior month period when roughly 35% were positive.